Cruise Darwin Harbour, a waterway alive with history, marine habitat and cultural significance. From shipwrecks to dolphins to hippies and crocodiles we explore Darwin from a different perspective. Officially a working harbour, the waters of Darwin share the comings and goings of cruise liners, supply ships and HMAS Coonawarra, with a plethora of sea animals and birds nurtured by healthy feeding grounds of sea grasses and mangroves. Surviving bombing raids during WW2 and the ravages of cyclones, Darwin Harbour is rich in both western history and aboriginal culture. We keep a close look out for wildlife and mammals and are often rewarded! The Sea Darwin Harbour Highlights cruise is an eco experience which varies from day to day and season to season. The local crew use the tides, the weather and the season to showcase harbour activity. As you cruise Darwin Harbour you will explore the unique diversity and dimension of the Harbour, taking in the habitat, history and intrigue of what is happening on the day. Visitors will experience the sounds and sights of a city harbour abounding with contemporary interest, drenched in history and with an unparalleled tropical marine habitat. 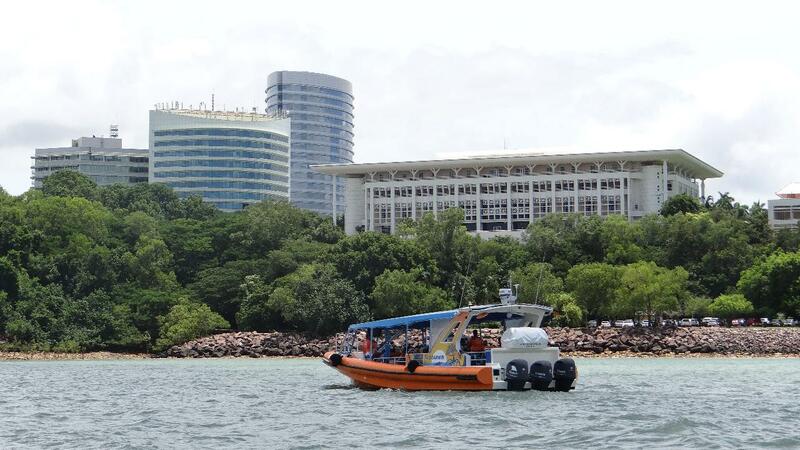 This Darwin Harbour adventure cruise goes where the other boats don’t go, giving you and up close and personal experience with the real Darwin Harbour. This unique tour has obtained advanced Ecotourism and ROC accreditation. Occasionally sight dolphins and other tropical marine life.